I had a wonderful, though very tiring, trip this weekend. 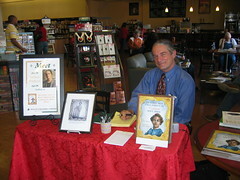 I spent a long day at the Books-A-Million in Texarcana, but it was a sell-out and that’s what matters most. I’ve already been invited back with my next books. I spent the night there in the Holiday Inn on State Line. A state convention of the teachers for the magnet schools of Texas were also at the hotel and they were having meetings today. Ironically, the hotel for the Texas teachers was in the Arkansas portion of Texarkana. It must be awkward at times to live in a city that is in two states. I drove back to Monroe this morning, wrote a TGIF article on the Civil War in Indian Territory and tended to some emails. Of course, I came back to the UNFINISHED work and chores I meant to get done before my trip. Below is a photo taken at my Texarcana signing. On easels I have the framed poster that Pelican Publishing made me and a copy of the only actual photo in existence of Jim Limber.